When I were in Odense with one of my friends we decided to take one of our other old friends under the arm and go to Egeskov Castle which is a little outside Odense. We took both the train and bus to get out there but the bus stops right outside the castle so that was not a problem at all. It was actually really easy. It is a bit pricy to get in, especially if you are a student but there is A LOT to explore out there. The castle itself is not that big but there is a lot of history in the paintings and the hunting trophies there are basically everywhere. In the attic they have this really creepy wooden statue/doll that is lying on its side and there is myth that says that if you move the statue, the whole castle will destroy itself and simply fall into the water around it. Creepy! Near the castle there is a little clothes museum with clothes from 1800 century and some of it is a bit older but not much. I found it really fascinating and took a lot of pictures because I love reading and learning about that period of time and I do love the corsages. The clothes are from the servants to the owners of the castle so you can see the different from poor to rich. There are also the different from winter to summer of course. Further down in the area there is another house with more clothes but also the carriages and cars they must have used and other equipment the works used on the castle and of course outside in the garden as well. The thing I think most people are coming for in the summer is the garden around the castle. It is huge and there are small signs that tell you what all the plants are. We brought some lunch with us and sat on the grass between hundreds of beautiful flowers. As a part of their huge garden they have a labyrinth you can try to solve. It is like in the movies, you can’t look over the hedges and you can’t really cheat. You have to find the center of the labyrinth where there is a platform that leads to the bridge over the labyrinth and out. It took us exactly 15 minutes to find into the center of the labyrinth. Again we were there a day where people was at school and work but at busy days there will be a employee that will make sure you get out again, If you get lost. They will give you a flag so you can show where you are and they will guide you out. Something I really enjoyed was the hanging bridges they have made in the trees! In the middle of their own little forest. It can be very nerve-wracking if you don’t like the height but there is a good view from up there. 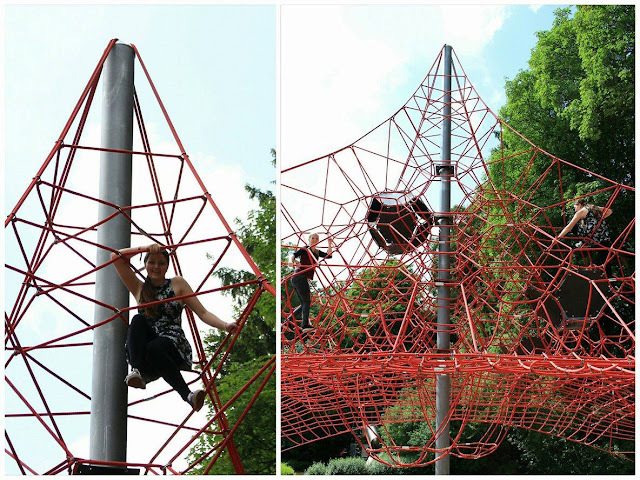 They also had a huge climbing tower on their playground that I enjoyed. I don’t why but if there is something I can crawl on and up I will always do it. I don’t really care that I am considered an adult in those situations! Haha. If you are interested they have a huge collection of vintage motorcycles and a showroom for bicycles through the ages. As well as old cars, planes and other machinery that I don’t really know much about but the old London bus caught my attention because I had seen it in movies before. It’s of course fun to see but it has never been a big hobby of mine, but I took some pictures for my parents and grandparents and they were very interested. So you can say that they have something for everyone out at Egeskov Castle.